A Hebrew with an unusual gift of strength must respond properly to the call of God on his life in order to lead his people out of enslavement. After his youthful ambition leads to a tragic marriage, his acts of revenge thrust him into direct conflict with the Philistine army. 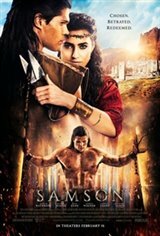 As his brother mounts a tribal rebellion, only Samson's relationship with a Philistine temptress and his final surrender both to the Philistines and to God turns imprisonment and blindness into final victory.